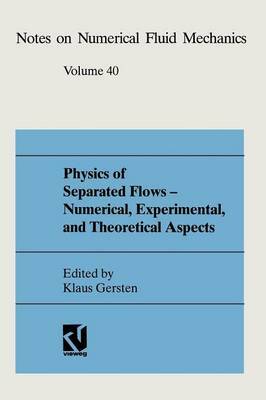 This volume contains 37 contributions in which the research work is summarized which has been carried out between 1984 and 1990 in the Priority Research Program "Physik abgeloster Stromungen" of the Deutsche Forschungsgemeinschaft (DFG, German Research Society). The aim of the Priority Research Program was the inten- sive research of the whole range of phenomena associated with separated flows. Physi- cal models as well as prediction methods had to be developed based on detailed experi- mental investigations. It was in accordance with the main concept of the research program that scientists working on problems of separated flows in different technical areas of application participated in this program. The following fields have been represented in the program: aerodynamics of wings and bodies, aerodynamics of auto- mobiles, turbomachinery, ship hydrodynamics, hydraulics, internal flows, heat exchan- gers, bio-fluid-dynamics, aerodynamics of buildings and structures. In order to concentrate on problems common in all those areas the emphasis of the program was on basic research dealing with generic geometric configurations showing the fundamental physical phenomena of separated flows. The engagement and enthusiasm of all participating scientists are highly appreciated. The program was organized such that all researchers met once a year to report on the progress of their work. Special thanks ought to go to Prof. E. A. Muller (Gottingen), Prof. H. Oertel jun. (Braunschweig), Dr. W. Schmidt (Dornier), Dr. H. -W. Stock (Dornier) and Dr. B. Wagner (Dornier), who had the functions of referees on those annual meetings.